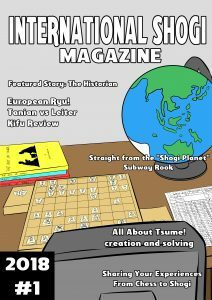 While researching shogi development in Europe for my master thesis, I have found many problems that shogi societies are bothered with, for example lack of teaching materials in English, lack of knowledge of how to teach shogi, and lack of information exchange between countries. 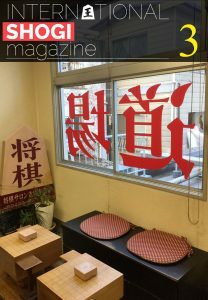 It is hard to solve those problems quickly – making of the new books is time consuming and information about shogi in other countries is spread in different places on the web. The magazine contains thoughts, impressions, reports, own analysis, commented games, newest strategies, news from the world, gallery with photos and discussions on various topics. 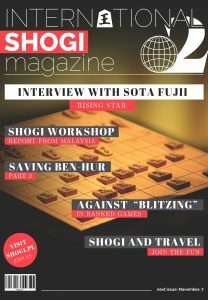 We hope that it will allow the shogi world to get a “voice” and a platform to exchange information and views. Those are important for shogi promotion in the world. If you would like to join the project or share your ideas, please contact me by email oneye@windowslive.com or send a message on Facebook ISM group.